As well as offering custom mouth guards for sporting activities to prevent dental injury, we also offer mouth guards to protect your teeth from bruxism, or teeth grinding as it is more commonly called. If you, or someone in your family, suffers from bruxism, you have every reason for concern! But we’re here to help and to reassure you. Give Delroy Park Dental Care a call today and make an appointment to be seen by the dentist to determine whether you need certain treatment as a result of grinding your teeth. We usually will recommend a night guard that is custom fitted. This device limits your ability to clench or grind your teeth. Custom-fitted mouth guards stay in place better than those you can purchase over-the-counter in your local pharmacy. Usually, grinding causes minimal wear to your child’s teeth. Baby teeth can withstand a lot of surface wear and tear without causing pain or additional problems. Most of the time, no treatment is necessary and you child will outgrow teeth grinding by the age of 10. 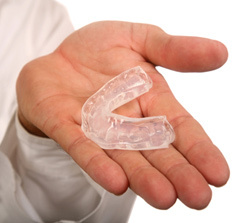 Contact us to schedule an appointment to find out whether you need a custom mouth guard. At Delroy Park Dental Care we’re here to ease your pain and your concerns!